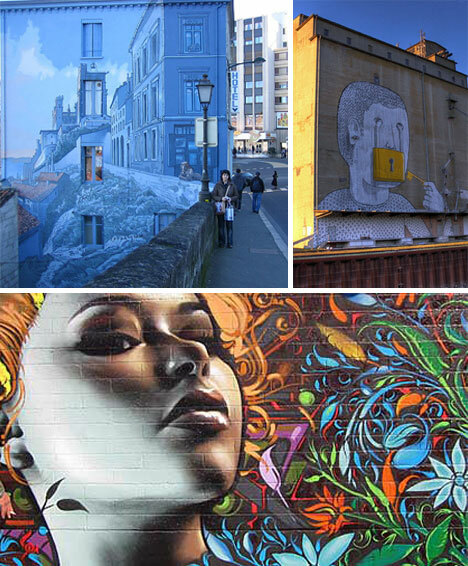 Alleyways and city streets are often criss crossed with urban art, though it usually takes the form of paint out of a can. 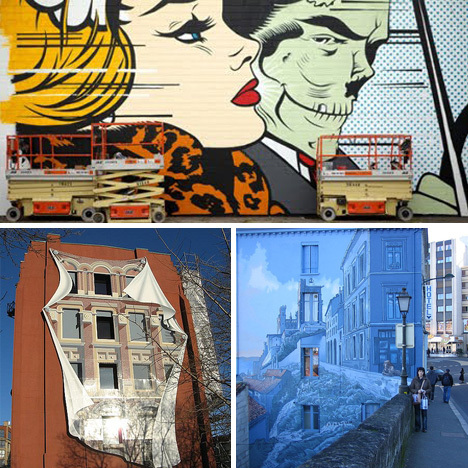 Thankfully this is not always the case, as urban property owners team up with exceptionally talented artists to create murals so realistic and interesting, that they could easily hang in a gallery, but so large that they hang on it, instead. 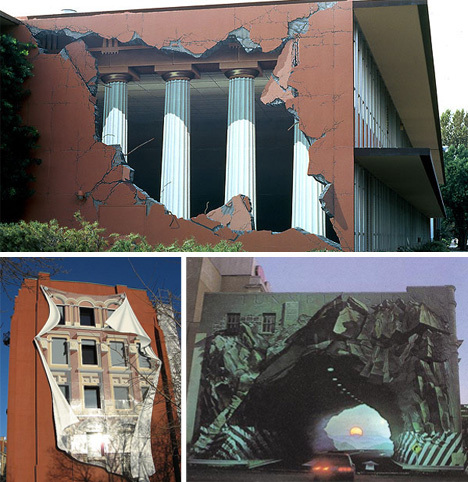 Artist John Pugh created this tear away painting revealing the skeleton of Roman architecture peeking out of a modern building. A gorgeous tunnel going through a building may serve as quality art and a fantastic view in Lyon, France, but it does pose a danger to the errant driver who decides to ride into the sunset. Meanwhile, in Toronto, the back of the Gooderham Flat Iron building serves as a city artistic staple, depicting the facade of gorgeous old architecture peeling away from a modern edifice. 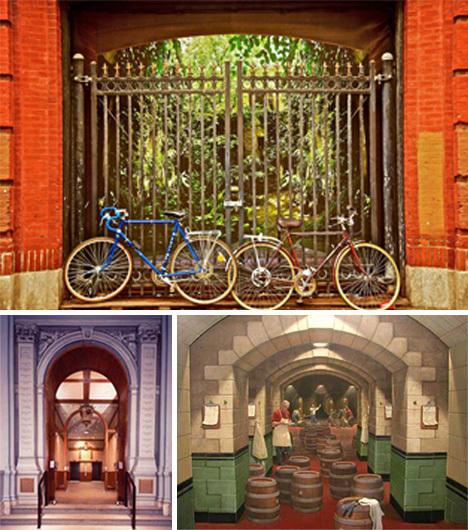 The Salem Street Power Building serves as a beautiful backdrop to an old gate and some very real bikes. One feels like they are peering into an expansive hall full of workers and wooden cask barrels, instead of a flat wall. At Boston’s Old City Hall, the trompe l’oeil style painting reveals a gorgeous entrance that doesn’t actually exist; displaying the depth of the history, without taking up the space. 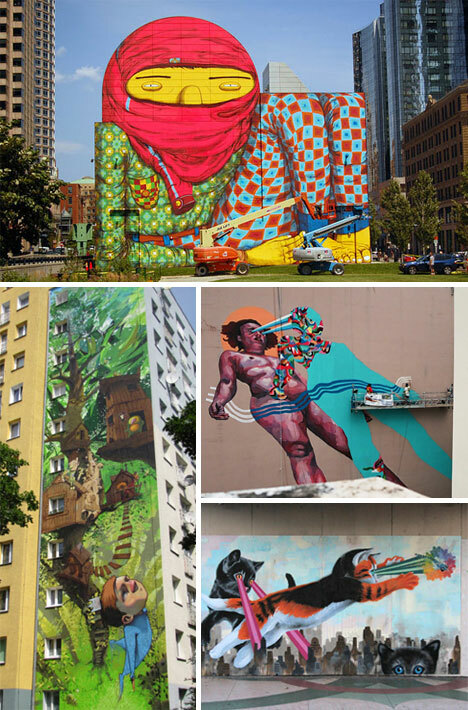 The Giant of Boston was a uniquely controversial addition to the city, by Os Gemeos graffitit artists, that has since become a staple of the downtown outdoor art scene. “Liberation and Revolution” is the name of a gigantic mural painted by the artist Ever, which, early though this picture is, portrays a stirring scene about life’s complexities, tempered by the image of laser-eyed cats frolicking on the side of a large building. Swiatecki created this 12 story masterpiece, in a solid 3 months of hard work. Escif, a Valencia-based artist, created this gigantic on/off switch to turn a few heads during an arts festival in Poland. Anat Ronen created a mural that is a bet meta, as it photographs you taking a photograph of it. 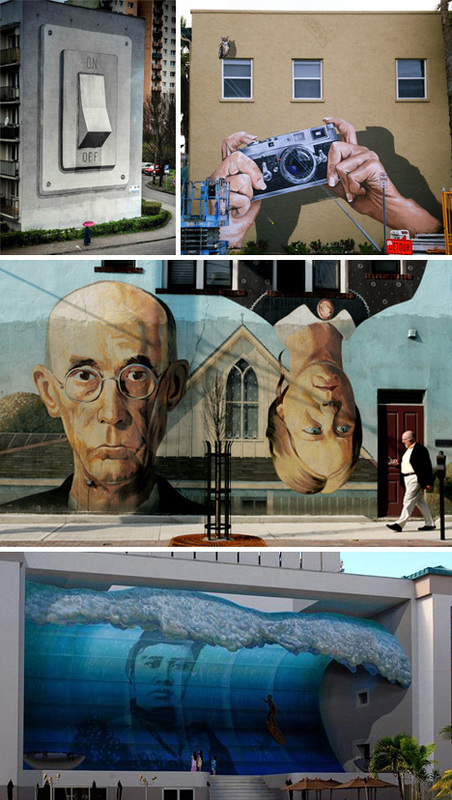 Columbus, Ohio features this play on the famous American painting “American Gothic” with an outdoor twist. Famous mural artist John Pugh created this depiction of the final monarch of the Hawaiian islands, Queen Lili’uokalani. The Beasley Building in Philadelphia holds this trompe l’oeil masterpiece, turning a once non-descript corner into a bustling construction zone. Kobra makes one feel like they stepped back in time, as a tall building holds a testament to the neighborhood’s past. Artists Saber and Shepard Fairey collaborated on this art piece, featuring two incarnations of the American flag in abstract. This gorgeous mural changes the entire landscape, turning it into a seaside view along the coast. In Vienna, Austria, an artist brought their vision to life in a thought-provoking piece brimming with sad emotion. Miles MacGregor created “FlowerPower Girl” which is both realistic and brighter than life. His other work can be found at Elmac.net. D*face put together this Los Angeles mural as an homage to pulp comics and posters of the past, with a darker edge. 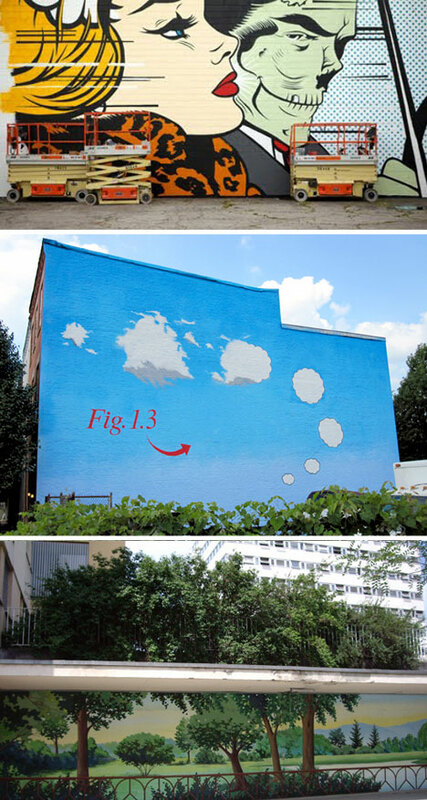 Artist John Pena put together this cloudscape, showing the transformation from nothing to something, to nothing. 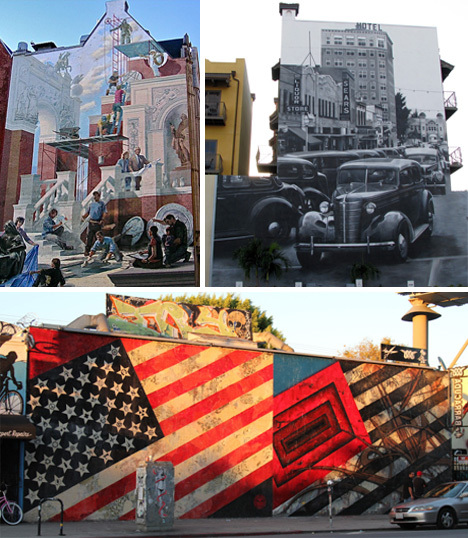 This final photograph is of a mural that wisely used the existing landscape to create a much different, and rural, feel for this city block.